← Descriptions That Pack A PUNCH! Let’s face it, mining for the best expression of emotions whether it’s body language, gut reactions, internalization or dialogue can be like panning for gold. A lot of useless grit is sloshed around before you hit pay dirt. Picture this: You’re sitting at your computer; the sun is shining through the window and you’re feeling happy vibes. Then scrolling to page 49 of your book, you realize you left a very angry Zelda stranded knee-deep in alligators at the office. Worse, because you, the writer are Zelda’s alter ego, you have to ditch your good day and feel what she feels . . . on paper at least. is exactly what I want to do with the written word. So where can a writer dig up these emotions? Once we know the emotion, to what degree should it be dramatized? I did some research on methods used by actors and discovered their tools crossover to writers. At Actor’s Exchange where actors, directors etc. exchange industry info, it was suggested that actors must first be aware of “all” facets of emotions. In other words, emotions don’t happen in a vacuum. What is the inciting incident that triggers emotion. Now that we know what we need to convey emotion, how do we do it? One method used by actors is called, The Methods or emotional memory technique of acting. This amounts to recalling personal emotions and what they felt like and then portraying that to the audience. A second method for an actor is to portray character emotions by Accessing Physical Reactions To Emotions. Actors can bring themselves to the edge of tears by triggering a yawn which brings tears. This won’t work on paper but writers can access and write physical reaction. Actor’s Exchange suggests that the best method to show emotion is to know the play/story, and the character.Duh! Sound familiar? 1] Be the character: Jump into his skin. The character is a combination of your experienced emotions, who the “character” is, his motivations and his situation. One article I found, Acting Emotions by Elly A. Konijn called this a “double consciousness,” the remembered emotion is the writers/actor’s but they are aware of the character’s circumstance and personality. 2] Allow the story contents to “trigger” the emotions you need. We all know and understand anger but there are varying degrees and ways of expressing it. The story’s content and the triggering event determine how a particular personality expresses an emotion. Is the character merely irritated or are they in a full-blown, red-in-the-face rage? Is this personality a show-all, tell-all, or are they withdrawn? Does the emotion make them want to throw up or are they so tough, nothing much affects them? Does the triggering event require a mind-blowing reaction or a minor blink of the eye? Writers have to dig deep, find the gold and turn it into an emotional jewel. For me, body language, dialogue and introspection are the easiest expressions of emotion. It’s the gut reactions that throw me. For this reason I’m including a list of possibilities. And yes, some examples cross over into the other emotional forms. This list just scratches the surface so I hope you’ll comment and add some of your own ideas. Be sure to see the links at the bottom of the blog. How To Monitor Your Emotions and Increase Emotional Awareness. While this site was focused monitoring your personal emotions and learning your triggers, it did have some interesting suggestions, including a chart that can be easily adapted to promote writer awareness of how emotions are triggered and expressed. Portraying Emotion With The Body. This is another site for actors and it’s worth stopping in. This article says the actor must study physiologically and everything that happens to an individual when he experiences any given situation. If an actor dies of freezing to death his actions will be different than if he’s dying of say a gunshot wound. A list with helpful examples is given. Actors’ Exchange: A font of information from people in theater. The link in the body of this blog takes you to the definitions I talked about. This link takes you to the main page. How To Portray a Dramatic Character: A repeat of points mentioned in this blog but worth a look. Acting Tips for Emotional Scenes: Comprehensive tips that translate nicely to writing tips. Also see links on my blog, Body Language: An Artistic Tool and Keep Characters True To Themselves. Let’s talk. How do you mine for character emotions? This entry was posted in Craft and tagged Actor's Exchange, actress, Body language, Character emotions, Conveying emotion, double consciousness, Elly A. Konijn, Emotion, Emotional memory for actors, Gut reactons, Keeping Characters True To Themselves, list of emotions, Physical reactions to emotion, Sharla Rae, showing emotion, The Methods, Writers in the Storm, writing, writing emotion. Bookmark the permalink. Thanks for stopping by. And you’re right, sometimes it’s very difficult to suffer what our character is suffering. Sorry Sharla and Jenny. I can’t seem to add a comment. Is wordpress angry with me … yes I can see the veins on their head swelling with anger, their jaw tightens and their silent disregard for my need to comment is shown in the stone, cold blankess of their faces. Ah ha, but I beat them by coming here. Just the mention of his name filled her with need, like I needed to comment and couldn’t by pass WP solid resolve. Of course, I could get a grip of my insides and take a short, measured breath and say … LOVE THIS POST!! Wonderful post with some amazing resources and tips! Lately, I’ve been using music as a way to get into a character’s skin. Making specific playlists of songs (instrumental and with lyrics) that remind me of a particular character, a certain relationship, or even a scene is really helpful to put me in the right “mood,” especially with characters that are particularly aggressive or angry (not my usual state of mind, lol). I’ll definitely be applying these suggestions to my WIPs! I mentioned this on Laura’s blog but as a Country Western fan, I love the emotion they express along with the story they tell. I use my own emotions, be they anger or hatred or happiness, to convey how the character would feel, although the circumstances may be totally different. I love your list of gut reactions. Thank yo for that. Glad you like the list. I always think of more and better stuff after I do a list. Makes me think of the old-time cartoons where they pictured blood veins bursting in a head and other unacceptable stuff. Ha! Great post, Sharla. I become my character to better understand what they’re feeling at that moment, and then write. Excellent post. Deep POV depends on being about to portray those emotions. But I’d never likened it to actors though they do mime everything. I’ll have to read this several times to make sure I haven’t missed anything. Teresa, every watch silent movies? The actors had to exagerate emotions because we couldn’t here what they were saying. It’s amazing how they did tell a story without saying a word! I just saw the ballet, Sleeping Beauty. It was beautiful. Similar to silent movies, the characters had to convey concepts through gesture. It was amazing how the the wicked fairy cast her spell on the Princess. Great postr, Sharla. Oddly, despite my background in theatre, I find I usually don’t think this way when writing. Thanks for the reminders and the great links. Loved this post, Sharla. It’s going into my clip and save file. And I love the chart…I’m a chart kinda gal! Glad you like it Sharon. Sometimes a list can spark just the right idea for your own book. Great post, Shar. And thank you for the links. I use another book on acting for writing purposes: The Power of The Actor by Ivana Chubbuck. For every scene, your pov character needs to get something from another character. For instance, you don’t say, I want love, but I want to get you to love me. Get it? Lorrie, thanks so much for sharing the reference. I’ll have to look up this one for sure. I have an extremely useful link for this discussion. THE BOOKSHELF MUSE (an awesome blog) has been building “The Emotion Thesaurus” for years. I constantly refer to it. Great physical and gut reactions to just about any emotion you can think of. Bren, Thanks. I think I have heard of this and you’re right, it’s a great site. Simply stunning post – thank you so much. I LOVE the concept of “double consciousness”. It’s exactly how I feel about writing my character’s emotions, but I never had the words for it. The naming of things is so powerful, and that name is so perfect. 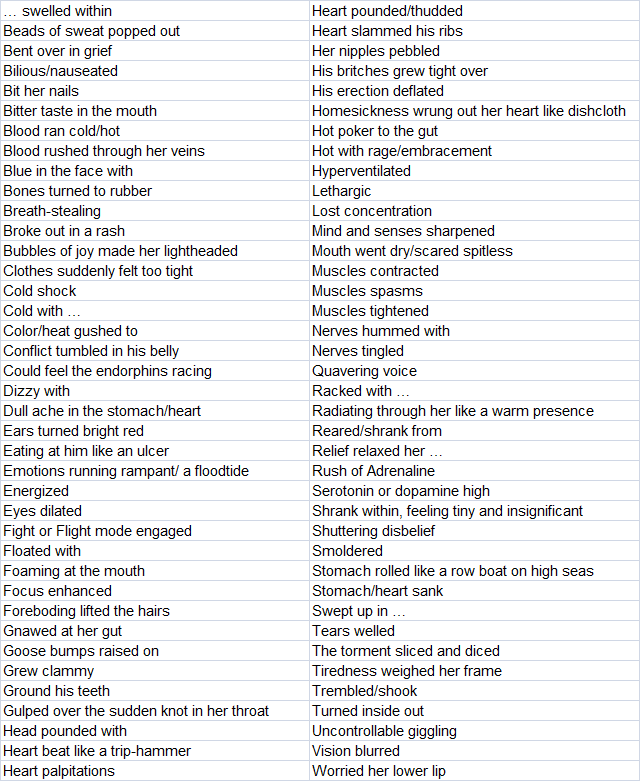 Thanks also for your wonderful list of visceral emotions/responses – so handy as we try to draw our readers in and make them really feel what our characters are feeling. Well done. This is a post every writer should read. Twice. And then print to have on hand. Nicely done and good advice for all word smiths. Thanks for stopping by Richard. I’ve copied and pasted this blog to my personal ‘writing tips’ file. I’m sure it’ll be really useful. Thanks Sharla. Personally I use a visual method, where I see in my mind’s eye the scene and the characters and then I see what happens and I try to record it as faithfully as I possibly can. Yvette, you sound like me. When I’m truly stuck on a scene. I actually sit and type with my eyes closed. Sounds silly but hey, whatever works, right? Not paying attention to the computer screen and instead seeing the scene in my head and typing is a great exercise.